Three up-and-coming AGS branch managers in Africa are validating the confidence that AGS Worldwide Movers places in supporting dynamic staff with fresh ideas. Iris Becquart, Sophie Bidau and Carole-Anne Duchet have a lot in common. All three joined AGS through long-term VIE internships after completing their studies, all three were posted to positions within AGS branches in Africa, and through their hard work and dynamic spirit all three have recently been appointed as branch managers in Africa. Three up-and-coming AGS branch managers in Africa are validating the confidence that AGS International Movers places in supporting dynamic staff with fresh ideas. Iris Becquart, Sophie Bidau and Carole-Anne Duchet have a lot in common. All three joined AGS through long-term VIE internships after completing their studies, all three were posted to positions within AGS Movers Africa, and through their hard work and dynamic spirit all three have recently been appointed as branch managers in Africa. According to AGS’ Group Human Resources Director, Christophe Mordelet, the decisions to send young female interns into challenging African business and cultural environments, and later to promote them to manage their respective branches, were neither taken lightly nor without precedents set by other top-performing young interns. “It was a challenge but I like to always go against the cliché,” reflects Christophe. Iris Becquart commenced her internship with AGS in 2008 in a sales role in Uganda, after completing her Master’s degree in International Transport, Logistics and Trade. Although she had never been in Africa before, Iris rose to the challenge. Sophie Bidau, by contrast, was already engaged in humanitarian work in Niger when she met with the AGS branch manager there, who encouraged her to apply for the programme. Like Iris, Sophie was comfortable working internationally. “My dad is in the military, so I never lived more than two or three years in the same place,” she says. Carole-Anne Duchet reveals that she’d already been living abroad ever since she was born in Germany, and her whole family share a love of travelling. Whereas Carole-Anne started off with AGS Movers Zambia and was later appointed in 2013 as the branch manager for the same branch – she describes working in Zambia as a ‘love story’ – it was somewhat different for Iris and Sophie. Sophie also experienced a number of countries with AGS, starting in Ghana and moving to Angola, then Kenya, then back to Ghana and later to Zimbabwe, where she was appointed the AGS branch manager at the end of 2012. According to Sophie the biggest challenge she had to overcome was adapting to the new rules and different ways of approaching people in each country she worked in, but her gender was never a factor. Sophie explains with a smile. Iris and Carole-Anne both agree with her on this point. “The men really want to support you and to respect you and to surprise you, so I guess there is a communication that is quite different,” adds Iris. Christophe himself challenged norms when he was appointed 18 years ago as AGS’ Human Resources manager at the age of 28 – making him the fifth youngest HR manager in France at the time. AGS’ Africa and Middle East Regional Director, Guillaume Dehem, provides a similar example – also despatched to Africa on the same long-term internship programme, Guillaume was appointed as branch manager and later given responsibility over the African network. 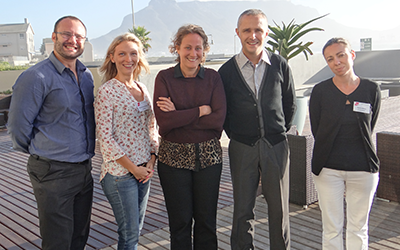 CAPTION: At the AGS African Conference in Cape Town, South Africa (Left to Right): Werner Steffen, International Human Resources Manager for Europe, Asia and the Middle East; Carole-Anne Duchet, Branch Manager: AGS Movers Zambia; Iris Becquart, Branch Manager: AGS Movers Rwanda; Christophe Mordelet, AGS Group Human Resources Director and Sophie Bidau, Branch Manager: AGS Movers Zimbabwe.